Chartered by the Glen Lake Optimist Club, Pack 215 is part of the Mustang District in the Northern Star Council of the Boys Scouts of America. Our pack is made up of boys from a number of different schools including Glen Lake Elementary and Gatewood Elementary in the Hopkins School District. We accept boys from any area school and we are always looking for new scouts. 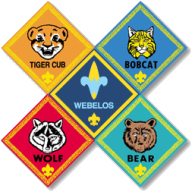 What's New with Pack 215? Welcome to our New Website! It's still a work in progress but this is the new online home of Cub Scout Pack 215. We are also going to start using Scoutbook for our pack planning, internal communication and advancement tracking starting with the new scout year. If you have any questions please reach out to the leaders on the Contact the Leaders page.